If cooking healthier meals at home is your new resolution, look no further than Bob's Red Mill's extensive collection of high-quality grains, flours, and other mouth-watering products. 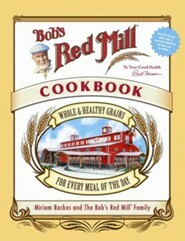 The Bob's Red Mill Cookbook will help introduce new whole-grain ingredients into all of your daily meals, without a huge investment in pricey, difficult-to-locate, limited products that do more to take up space than change nutrition habits. Whole-wheat flours, brown rice, whole beans, and legumes have become prevalent in supermarkets everywhere, but among the hundreds of products milled at the Bob's Red Mill plant are also blue corn flour, quinoa, amaranth, teff, and all varieties of nuts and seeds, and they can be integrated seamlessly into any diet to delicious effect. The unique, family-owned mill has been in the business of producing healthy whole-grain products for over 30 years, and they provide here more than 350 recipes for all sorts of everyday meals: morning food, snacks and sides, main courses, soups and stews, and sweets, with plenty of vegetarian and gluten-free dishes. 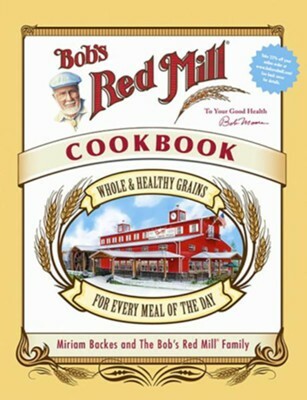 This practical and comprehensive cookbook is an outstanding collection of reliable recipes that reflect the Bob's Red Mill product quality, product diversity, and dedication to healthful eating. Becoming a more inventive cook is a stepping stone to a healthier outlook, incorporating better ingredients for a better life. Bob's Red Mill Natural Foodsthe nation's leading miller of diverse whole-grain foodswas founded in 1978 and has become a multimillion-dollar business with international distribution. Inspired by a commitment to whole-grain nutrition, Bob and Charlee Moore started their business with a mission to support the health and well-being of people in every community. The company's more than 300 products are available throughout the U.S. and Canada at all major grocery stores. Bob's Red Mill brand products can also be purchased by phone, mail order, or on the company's website. Miriam Backes, former cookbook editor at Rodale and Food & Wine, has an impressive list of health- and diet-conscious cookbook credits to her name. She lives in New Jersey with her husband and two sons. "This magnificent book points the way to healthy, delicious dining, while covering all the basesincluding whole grains, gluten-free, vegetarian, and vegan. Serve these mouth-watering recipes to your most discerning guests, or treat your family to good eating every day. Theres something here for every taste and palate and everyone will agree: this book is a winner." "I'm a big fan of Bob's Red Mill products, and this generous collection of alluring recipes offers lots of inspiration to put them to delicious use." "This in-depth study of whole grains provides the home cook with an extensive repertoire of wholesome recipes." 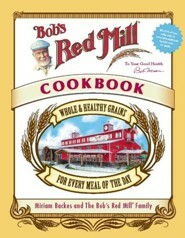 I'm the author/artist and I want to review Bob's Red Mill Cookbook.